On nonprofit boards and in service-learning at Whitworth, Keith Kelley shares his passion for West Central. They call the kids “dreamers.” They’re a class of seventh graders from Lidgerwood Elementary, selected by nonprofit Reach for the Future when they were in second grade to receive college tuition or vocational school training if they complete a mentoring program and graduate from high school. They don’t have statistics on their side. Dropout rates are high, as is the portion of kids who’ll transfer schools before the year is over, shaking the stability in their lives. So the program aims to provide a positive, stable presence. But for Keith Kelley, a board member of the group and an activist for the West Central neighborhood, one class wasn’t enough. Kelley asked the group to adopt another class, but when they couldn’t for fundraising reasons, he set about doing it himself. Today, with the help of a partner from Goodwill Industries, Kelley is looking to raise between $250,000 and $500,000 to start a new program. By the start of the school year in 2015, he’ll select the new class of students (he won’t yet announce it in fear of affecting enrollment) and, under the moniker “Opportunity Scholars,” they too will get tutoring and mentoring. They’ll get the chance to dream. “Following the kids is the easiest way to maintain a focus on positive change,” Kelley says. Kelley is deliberate in his work and in the way he speaks slowly, crafting every sentence just so. In a green button-up shirt and rimless glasses, he’s on a first-name basis with the baristas at Indaba and waves to people who pass on the sidewalk. 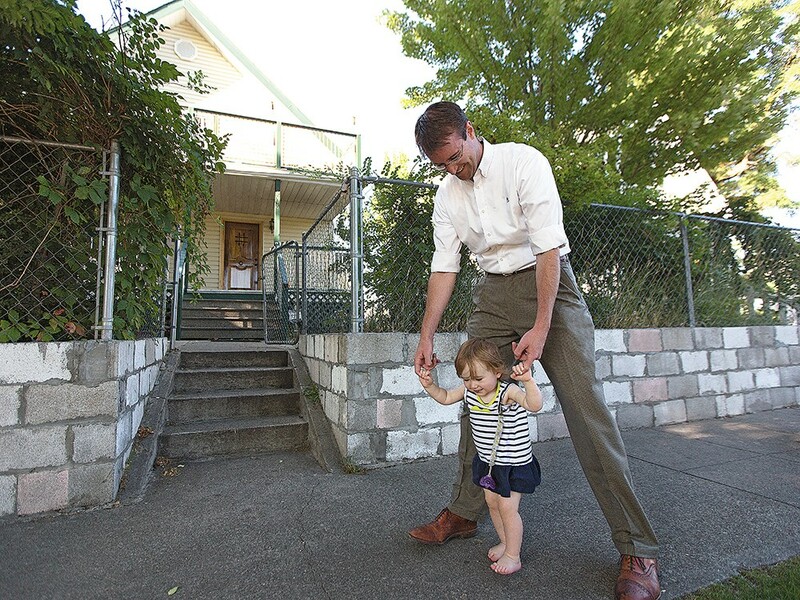 Kelley moved to Spokane in 2001, and when his employer, Whitworth University, began to focus its outreach work on the West Central neighborhood, he moved to the neighborhood too. He’s become an advocate for the area, if often from behind the scenes. He also sits on the boards of Reach for the Future, the West Central Community Development Association, the West Central Association of Businesses and Spokane Housing Ventures. As director of Whitworth’s Center for Service-Learning and Community Engagement, he’s helped find students volunteer opportunities at local nonprofits. He started two small businesses here, with the hope of using his the money he makes to support local nonprofits like Project HOPE, an initiative aimed at West Central’s at-risk youth. And when he saw service ignoring economic development, he started Whitworth’s Small Business Support Center, where students help businesses develop websites and business or marketing plans. The longer Kelley calls West Central home, the more he finds himself fighting for it, correcting people who call it “felony flats” — a nickname that makes him visibly cringe — and pointing out its strengths: location, history, houses with big front porches. He has hopes for the neighborhood, but takes pains not to paint it as a charity case. It’s what the nonprofit world calls an “asset-based approach,” a theory that promotes viewing a neighborhood based on its strengths instead of its weaknesses, believing problems in a community can be solved by the community itself. “It’s not to say the neighborhood doesn’t have rough spots or issues at times. I’m not in denial about that,” Kelley says. Indeed, West Central has room for improvement. It’s one of the state’s poorest neighborhoods, and a study last year by the Spokane Regional Health District found high rates of alcohol abuse, teen pregnancy and infant mortality in the area. “But to counter that, we have a lot of residents who are really passionate about making this neighborhood a better place to live,” he says. Kelley sees his businesses, a property management company and vacation rental, as a way to give back more than his salary at Whitworth would allow. He offers the lavishly remodeled two-bedroom home he usually rents to vacationers as a free spot for nonprofits to host retreats, helping those who suffer “vicarious trauma” from their work. Today, Kelley is preparing to leave his job at Whitworth to focus more on his young family and to “be intentional” about how he serves next. He’s worried that development in Kendall Yards, on the river-facing edge of West Central, could drive up property values to the point where people who’ve lived in the area their entire lives will no longer be able to afford it. He’s concerned about things like the rate of smoking among pregnant women in the neighborhood — the highest in the county. And he needs to fund the dreamers.